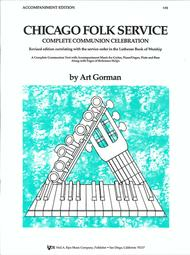 Chicago Folk Service New Edition - Accompaniment composed by Arthur Gorman. For choir. This edition: New Edition. Collection. Choral, Sacred. Grade 2. Accompaniment part. Published by Neil A. Kjos Music Company (KJ.V81).ISBN 084974170X. Choral, Sacred.